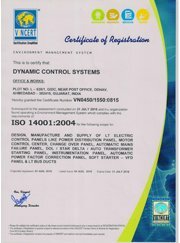 Electrical Control Panel in India, Electrical Control Panel in Ahmedabad, Electrical Control Panel in Gujarat. DCS supply range of electrical control panel in India, Ahmedabad, Gujarat. 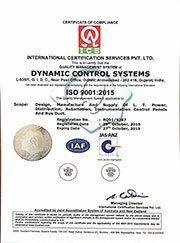 DYNAMIC CONTROL SYSTEMS was established in 2008 by young, dynamic and qualified professional Mr. Rajesh Patel to expand our market share in the Electrical field as well as Instrumentation. Under the able guidance of our mentor Mr. Rajesh Patel, our organization has achieved remarkable success since its establishment. His strong business acumen and rich industry experience has played a vital role in the growth of our organization, backed by a team of highly proficient, talented, and diligent workforce. Tag :- Electrical Panel in India, Electrical Control panel in India, Electrical Control Panel Manufacturers in India, Electrical Control Panel Manufacturing Companies in India, Electrical Control Panel Suppliers in India, Electrical panel supplier, Electrical Control panel manufacturer, manufacturers, manufacturing, Electrical panel manufacturing company, Electrical Control panel manufacturers in India, Electrical panels design in India, Electrical panel manufacturers, Electrical Control Panel manufacturers in Ahmedabad, Electrical Control Panel design in Ahmedabad, Electrical Control panel manufacturers in Gujarat, Electrical Control Panel design in Gujarat. This Is To Certify That M/S. 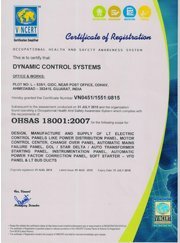 Dynamic Control Systems, Odhav, Ahmedabad Has Been Associated With Our Organization Ad Registered Vendor Since Year 2014. They Have Supplied Us Various Kind Of Products Like Pdb, Metering Panel, Bus Duct, Pcc, Hvac, Apfc Panels Etc. We Appreciate The Service & Support With We Receive From M/S. Dynamic Control Systems. This Is To Certify That M/S. Dynamic Control Systems, Odhav, Ahmedabad Has Been Associated With Our Organization As A Registered Vendor For Various Types Of Panel, Since Year 2013. During This Period They Have Supplies Us Various Kind Of Panel Like Mcc Panels, Vfd Panels, Plc Panels Etc., They Have Provided The Best Services Of Panels. They Are Good At Engineering, Detailed Drawings And Service Support. We Satisfied With Their Workmanship. We Wish Them Good Luck, For Their Future Assignments. We Here By Certify That We Are Purchasing Various Control Panels From M/S. Dynamic Control Systems Since Last Four Year For Our Project Requirements. M/S. Dynamic Control Systems Can Supply Different Control Panels. We Are Satisfied With Their Products & Workmanship. We Wish Them Good Luck, For Their Future Assignments. This Is To Certify That M/S. Dynamic Control System Is Working With Us Since Last Four Years. We Certify That We Are Purchasing All Types Of Electrical Panels From M/S. Dynamic Control Systems Since Last Four Year For Our Project Requirements. M/S. Dynamic Control Systems Can Fulfill Our All Types Of Requirements. They Are Good At Engineering, Detailed Drawings And Service Supports. We Are Satisfied With Their Product As Well As Working Style. We Wish Them Good Luck, For Their Future Assignments. This Is To Certify That M/S. Dynamic Control Systems Has Been Working In Our Organization From Period 2009-2014. During This Year It Has Supply The All Kind Of Panel Like Mcc Panels, Vfd Panels & Plc Panels Etc. It Has Provide The Best Services Of Panels They Are Good At Engineering, Detailed Drawings And Service Support We Are Satisfied With Them Workmanship. We Wish Him Good Luck For His Future Assignments. We Are Glad To Inform That We Have Used Electrical Panels Of M/S. Dynamic Control Systems For Our Project Luxuries Showroom. We Are Completely Satisfied With Their Quality And Punctuality In Deliveries. This Is To Certify That M/S. Dynamic Control Systems Has Been Working With Our Organization From Year 2013. During This Year It Has Supply The All Kind Of Panel Like Mcc Panels, Vfd Panels, Plc Panels, Pcc Panels Etc. It Has Provided The Best Services Of Panels. They Are Good At Engineering Detailed Drawings And Service Support. We Are Satisfied With Them Workmanship. We Wish Him Good Luck For His Future Assignments. This Is To Certitude The M/S Dynamic Control System, Odhav; Ahmedabad Has Been Associated With Our Organization As A Register Vendor For Various Types Of Panels Since Year 2015. During This Period They Have Supplies Us Various Kinds Of Panels Like Ups Output Distribution Panel, Pac Distribution Panel, Power Distribution Panel Etc. They Have Provided The Best Services Of Panels. They Have Good At Engineering, Detailed Drawing And Service Support. We Are Satisfied With Their Workmanship. We Wish Them Good Luck For Their Future Assignments. This Is To Certifyu That M/S. Dynamic Control Systems Is Working With Us Since Year 2010. During The Period They Have Supplied Mcc & Pcc Panels. They Are Providing Best Service For Product. Their Job Like Engineering, Detailed Drawings And Service Support Is Excellent. We Are Satisfied With Their Workmanship. We Wish Them Good Luck, For Their Future Assignments. This Is To Certify That M/S. Dynamic Control Systems Has Supplied Us 6 Nos. Pdb Panels For Our Adani Power Ltd. At Gandhidham. All Panels Are As Per Our Requirements And Working Satisfactory. We deliver innovative customised solutions as per the requirements.